It seems that spring is finally coming to Welkinweir: this week there has been an explosion of birdsong, bulbs are pushing their leaves up out of the ground, and a few of our early bloomers have come out in show-stopping force. So the question I asked is…why? How do plants in particular know when to wake up in the spring? The answer has two parts. Our climate is driven by temperature and precipitation; for the purposes of my answer, I’m more interested in the former factor. And temperature as we all know is driven by the sun. Because the Earth is spherical and tilted on an axis, it doesn’t receive sunlight in equal amounts across all areas and at all times; instead, as it rotates around the sun throughout the year, different parts are exposed to the sun for longer and shorter periods. During the winter, the northern hemisphere (where we’re located) is tilted away from the sun, so the sun’s rays reach us at a lower angle and with less intensity than during the summer, when the northern hemisphere is tilted toward the sun. This means that our days in the winter are shorter and colder. Plants are aware of the changes in light throughout the year, and many use those changes to dictate when they flower. This awareness is called photoperiodism. Most plants are categorized as short-day, long-day, or day-neutral plants, although these terms are misleading – plants actually measure the length of night, not day. They measure this time period using phytochrome, a light-reactive protein in their cells. Some well-known short-day plants include poinsettias, chrysanthemums, camellias, and Christmas cactus; they prepare to flower as the nights get longer (and the days shorter). Long-day plants include asters, most sunflowers, hostas, snapdragons, and purple coneflower; as the nights get shorter (and the days longer), they set flower. Day-neutral plants flower independently of night length. Therefore, as the nights grow shorter as spring approaches, the plants in our gardens take it as the cue to begin their flowering cycles anew. The other factor that influences plant cycles is temperature, which drives when a plant goes into and comes out of dormancy. 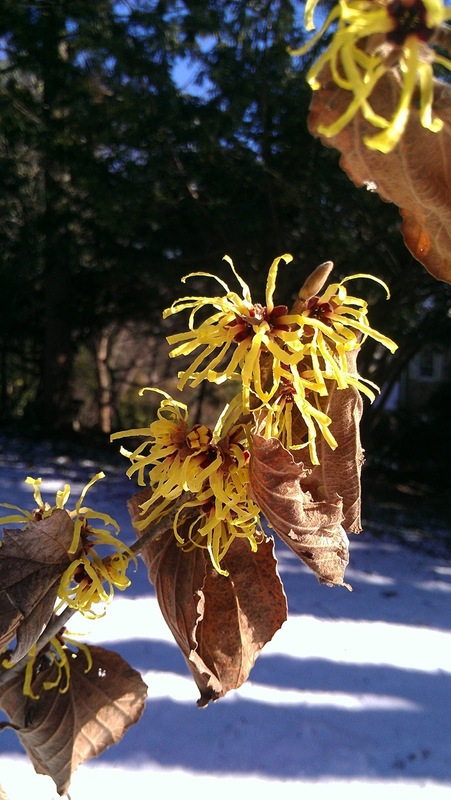 Most of our garden plants – from magnolias and witch hazels, to coral bells and columbine – respond to specific temperature changes, and each need their own unique period of cold temperatures in order to flower. This is called vernalization (another misleading term, as vernal means “of, relating to, or occurring in the spring”), and it varies widely among plants. Some plant species require a combination of the right temperature and light ranges; this has been studied in cereal crops such as winter rye. In summary, according to Steve Bogash, the Southeast Regional Horticulture Educator for Penn State’s Cooperative Extension, “Plants begin preparations for winter largely based on the increasing length of the night (shorter days), but temperature is important to the dormancy and hardening processes. They break dormancy and resume growth in the spring based on increasing temperatures”. A bit of a lecture, I know! But I found it fascinating, if a bit confusing. 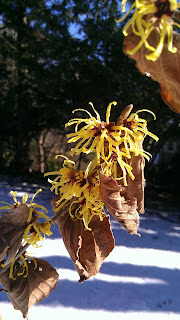 In celebration of springtime, here are a few photos of our witch hazels defying last week’s snowstorms, a Christmas rose in the Barn Ruins, and snow drops. They’re still lighting up the arboretum grounds, so come visit Welkinweir to enjoy the year’s first flowers! And stay tuned, because in the next week or two we should be seeing the blooms of our two beautiful Persian Parrotia trees! Bogash, Steve. “Timepieces in Our Plants”. Hort Report. Pennsylvania State University Cooperative Extension, Southeast Region. Page 2. Bogash, Steve. “Timepieces in Our Plants”. Page 4. “Timepieces in Our Plants”. Page 5.